Best Food Dehydrator Reviews - Why do i need a food dehydrator? These types of dehydrators have trays that are stacked upon each other and normally have base mounted fans, although some have been known to be in a power unit above the trays. Air is heated and pushed up along the side of the dehydrator and then through a centre hole in the trays and then exited. One of the key selling points for the stacking type is they are flexible in being able to remove the trays to adjust for batch sizes and are suitable for very large quantities. Stacking dehydrators are also normally the cheaper option out of the two types of unit. The shelf type dehydrators, rather than being stacked, the shelves slide in and out. In these units, the fans are normally located in the rear of the dehydrator and heated air is blown across the shelves from the back to the front. One of its key features is that the way in which it is designed, makes drying more even without the need to rotate the trays. This type of unit is also more for drying wet ingredients such as purees or liquids. Either dehydrators work well, it just depends on what will suit your needs and budget. Also remember that some have quite noisy fans, and additional features like timers are always a plus. So, happy shopping and happy drying! Let’s compare the 4 best food dehydrators available in the market based on the features considered while buying any best dehydrator. It comes originally with 9 trays but can be extended to hold a whopping 15 tray for maximum drying capacity! 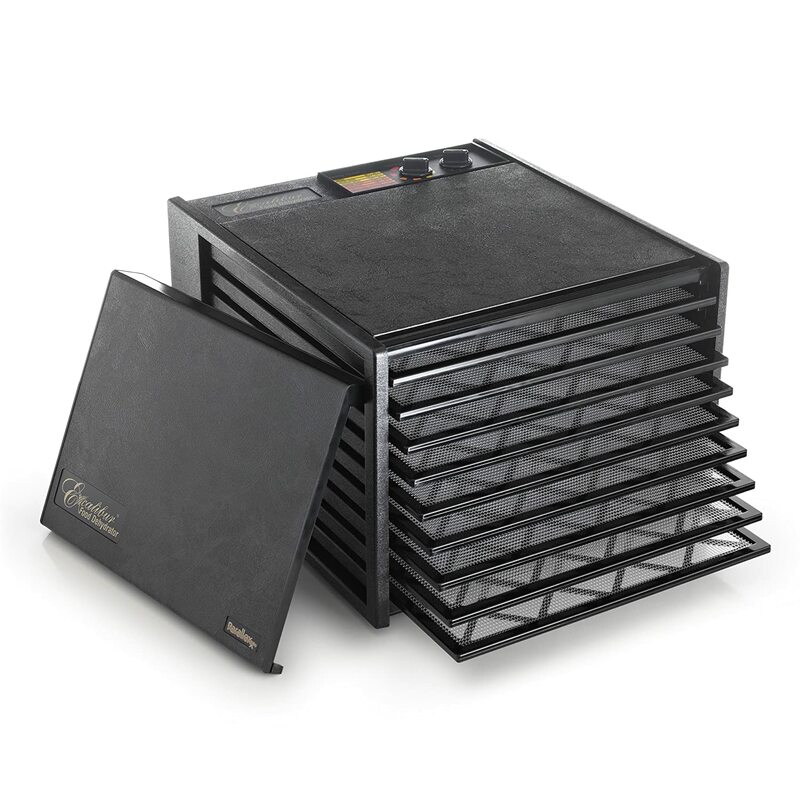 Being a little bigger than many stacking type dehydrators, measuring 19 x 17 x12.5 inches, the Excalibur 3926TB it is great for large families, gardeners or sportsmen. It is a very easy system to use and will look great in anyone’s kitchen. It comes with a 10 year warranty, offering you maximum peace of mind should anything go wrong. So, if you want a machine that looks great, has a massive drying capacity, works well and you are not on a budget, then the Excalibur 3926TB may be the one for you. It comes with 5 trays originally, but the unit can be extended to take up to 12 trays for maximum capacity drying. It is relatively compact dehydrator (13.8 x 22.1 x 13.9 inches), so will not take up too much room in your kitchen. It is made using Opaque Vita-Save which helps block harmful light that destroys he nutritional value of the dehydrated food. It may be small and relatively inexpensive, but the Nesco Snackmaster certainly packs a punch and can be used for drying fruits, soups, herbs, spices and so much more. This dehydrator also has the benefit of being made by a brand name in the world of food dehydrators and have been developing them for over 30 years, so you know you can be pretty same with them. Also, with a 1 year warranty, what have you got to lose? It has a very stylish design, and is much smaller than that of the Excalibur 3926TB measuring at only 17.71 x 13.58 x 12.40 inches. 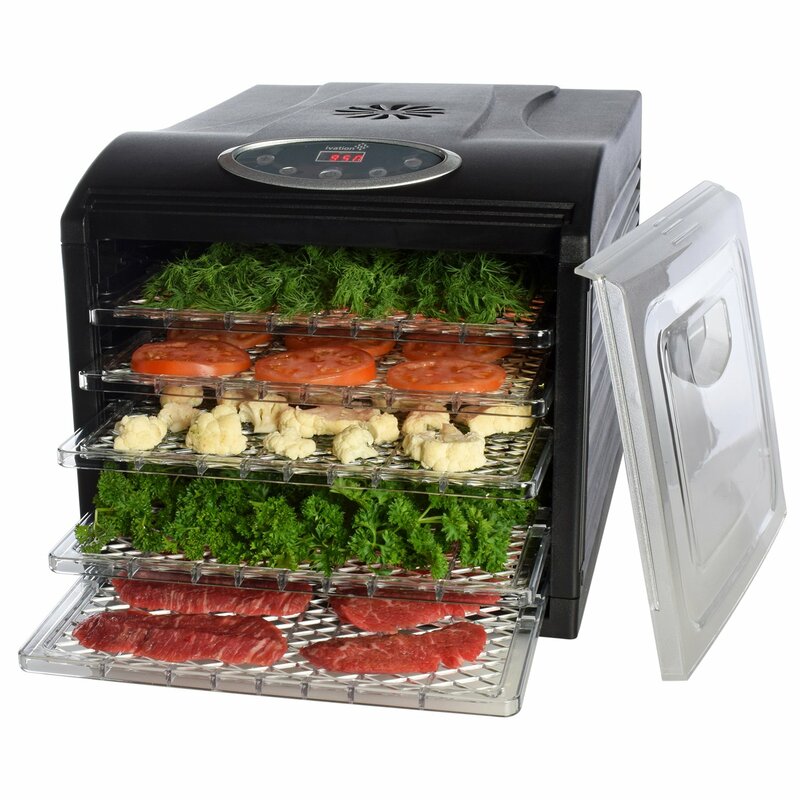 It is supplied with 6 adjustable drying racks that are 13 x 12 inches in dimension; this dehydrator is perfect for large families, gardeners, sportsman and anyone else who may want to dry a large amount of food at once. It comes with a drip tray for maintaining cleanliness. It is rear mounted fan to promote even drying without overheating. The fan on the Ivation food dehydrated is rear mounted which is designed to promote even drying without overheating. Being much more affordable than the Excalibur 3926TB, at around $120 you can own one of these little beauties, which is great if you are looking for this type of dehydrator and on a more restricted budget. Suitable for drying fruits, meats, jerky, herbs and more this practical and easy to use hydrator should not be ignored and would be great for anyone just starting in the world of dehydrating. It usually supplied with 6 trays when you purchase it, and like the Nesco Snackmaster Pro, you can extend to 12 trays if needed. It has a bottom-mounted fan and heating element that provide continuous air flow for maximum drying efficiency. It comes with a see-through cover so you can keep an eye on how your delicious treats are doing. It is with an automatic shut off feature included you can also be assured that you will not dry your food longer than necessary and the machine is not left running when no need! 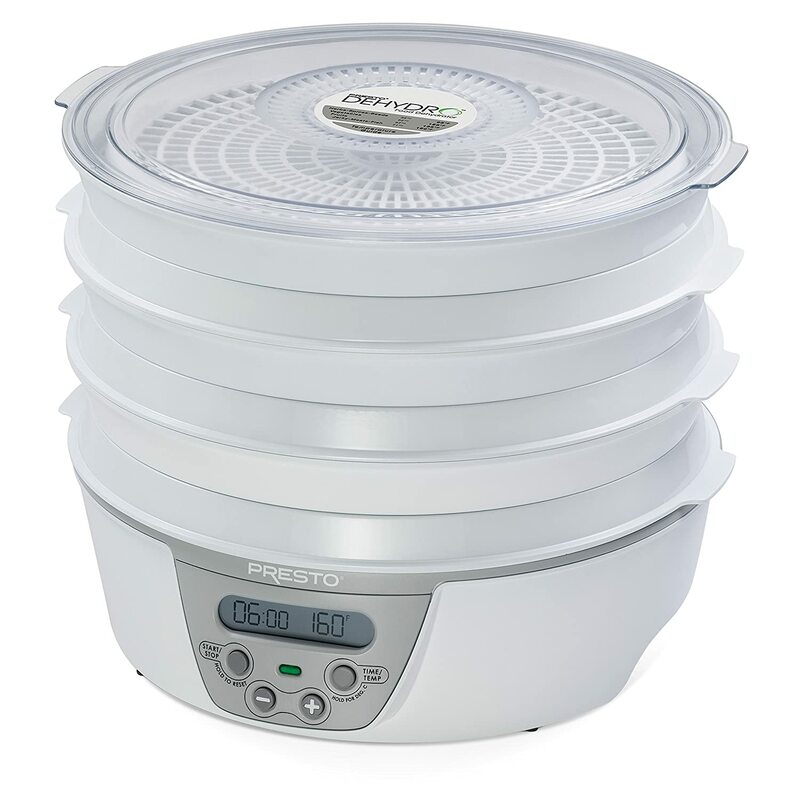 Overall, the Presto 06301 Digital Electric Food Hydrator is a good, compact, inexpensive dehydrator that can be used for multiple items so is definitely worth taking a look at for your next dehydrator if you are going for this type. 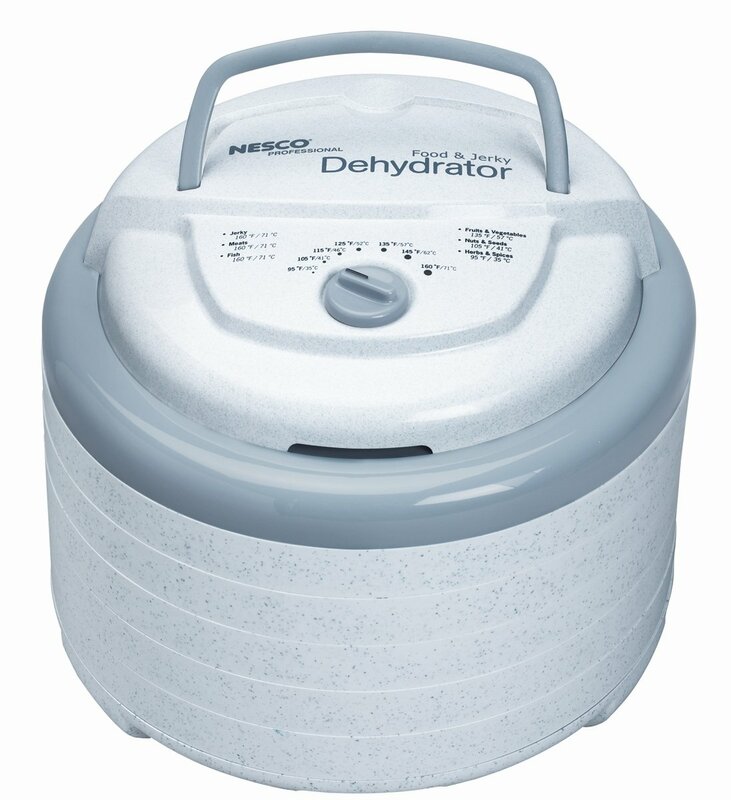 What are you going to be using the food dehydrator for? Will it be used just once in a while to do a large amount to keep stored? Will it be used regularly for a large amount of people (i.e. sportsmen, gardeners)? Will it be out all the time or have you got somewhere in mind to store it? Where are you going to put the dehydrator if it is out all the time – what space is available? If you are limited on space it may be worth considering the stacking type dehydrator as these tend to be less bulky then the shelf type. Do you want the fastest drying or the most efficient drying food dehydrator? Vertical fan drying systems will quickly dehydrate food on the lower trays, sometimes leaving the food on the top shelves not quite done. With horizontal fan drying systems they provide a uniform effect on every tray for maximum efficiency all around but take longer to produce the same results. Some food dehydrators are more efficient than others, so this is always worth considering before your purchase as you don’t want the cost to greatly outweigh the benefits. You should consider how often the dehydrator will be used (i.e. several times a week, once a month, etc.) and weigh up the amount of food you need to cook and how often and keep the wattage of the appliance in mind. How much are you looking to spend on your food dehydrator? As with anything else, these machines can vary greatly in price, depending on what it is you need. Is it going to be used daily or just once in a while? Consider how often you will be using the food dehydrator and weigh it up against how much food you will be producing or saving and see what is affordable for you. You may also want to consider what other additional features the food dehydrator offers for your money. One must have feature for many people is that there must be both an adjustable timer and thermostat. This is important to regulate temperature to its most efficient capacity depending on your requirements. Some people may want to consider what material the dehydrator is made from or is the style right for you and your kitchen? Does it come in the colour you want? Do you want to be able to see the food while it is drying? All of these things mentioned are worth thinking about when deciding which the best food dehydrator is for you. Good research is a valuable tool and can save you time and money in the future if you choose a food dehydrator that is not right for you, so we hope that our best dehydrator reviews have assisted you in making your decision. The health benefits of eating dried foods as well as the potential cost saving benefits, food dehydrators can definitely be an advantage for anyone that owns a kitchen and likes to eat! With the various shapes, sizes, colours and types, there really is a suitable choice for anyone out there who wants to jump on the bandwagon and try out these fantastic appliances. 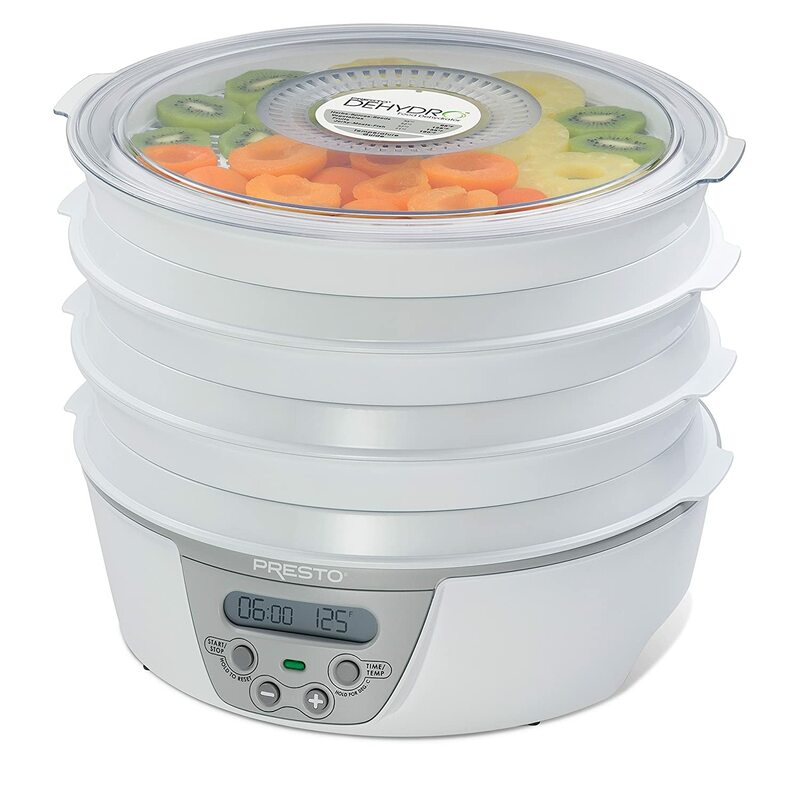 So, what are you waiting for – go and grab yourself the best food dehydrator for you!